The XR Series combines the Retrax PowertraxPRO MX retractable truck bed cover with an integrated Trax Rail System that allows for unique and personal customization above your truck bed cover. The XR Series optimizes cargo capacity with the cover open or closed, providing the ultimate versatility in cargo management. Heavy Duty Aluminum Slats Constructed from heavy-duty aluminum slats that are engineered to retract without joints or hinges that can trap dust, wear out or freeze. The XR Series combines all the great features of the the Retrax PowertraxPRO MX with an integrated Trax Rail System that allows for unique and personal customization above your truck bed cover. The XR Series optimizes cargo capacity with the cover open or closed, providing the ultimate versatility in cargo management. The Trax Rail System will work with most T-slot accessories from Yakima, Thule, Rhino Rack, and many more offering endless possibilities (Accessories Sold Separately). Pairing the Trax Rail System with accessories offers double the cargo capacity. This unique technology frees up the hitch with the ability to mount bikes, coolers, outdoor gear and more on top of the bed cover by combining the Trax Rail system with the t-slot accessories. The Retrax PowertraxPRO XR combines industrial strength aluminum with a powerful and incredibly scratch resistant matte finish paired with a low-profile patented design that streamlines the overall appearance and provides a firm seal. This retractable truck tonneau cover is operated via a wireless remote keyfob, easily opening and closing with the touch of a button. The integrated LED cargo light is also operated by the keyfob with an auto shutoff feature. An electromagnetic brake allows the cover to lock in any position along the rail allowing you to have unlimited cargo hauling capacity. 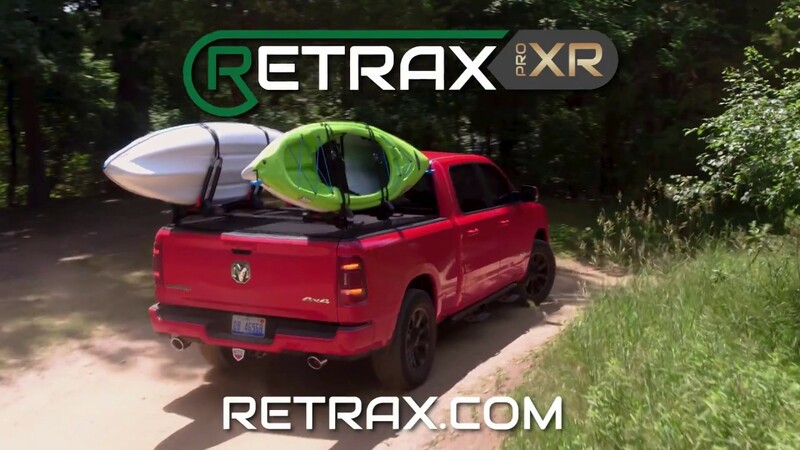 The Retrax PowertraxPRO XR retractable truck bed cover can be installed on your pickup quickly. It has an easy clamp on installation. Each product comes with easy to understand installation instructions.